Editor’s Note: Andrew Klavan is a two-time winner of the Edgar Award, awarded by the Mystery Writers of America. He’s written screenplays, and some of his best-selling novels have become movies starring A-list Hollywood actors. Klavan is also an outspoken Hollywood conservative and Christian. 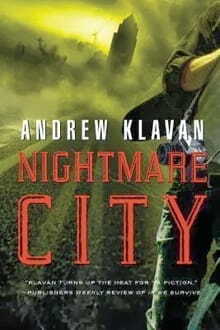 Kent Covington, senior correspondent for WORLD's daily radio program, The World and Everything in It, talked with Klavan about cultural renewal, and about Klavan's latest novel, Nightmare City. Andrew, tell us about the book. It hit shelves just last month. What is it about? It’s about a young man named Tom Harding who’s a reporter on his high school newspaper, and that’s his personality. He’s the kind of guy who always wants to get to the bottom of things and is very committed to telling the truth even when he himself doesn’t like the truth. One morning he wakes up, and everything is changed. His home is empty. His family is gone. The city is empty. There are strange voices coming out of his television set. There’s a fog moving in, and in the fog there are strange creatures moving around. He can’t quite tell what they are. What happens is that suddenly he finds that he’s got to get to the bottom of a story that’s unlike anything he’s ever been through before. And it develops into something I call an adventure story and a ghost story combined. OK. How does it end? You know, I think you’ll have to read it to find that out. All right, you win. How did you come up with the idea for this book, and, more broadly, how do you generally come up with your ideas? Well, I can’t really tell you where I came up with the idea, because it gives too much away. I started with a revelation that comes about halfway through the book. That’s where the idea came from. Usually, although I don’t know where ideas come from—they just come—my stories come from a ‘what if’ question. What if you looked in on your baby at night and he wasn’t there? What if you woke up and your city was empty? What if you were suddenly captured by Islamic terrorists? Those questions come, and as you answer them you realize if it’s a true basis for a story or not. Now, you are an unabashed conservative. There aren’t an awful lot of you, as a percentage of the whole, in Hollywood. Are conservative ideas getting any more sunlight in Hollywood these days? I think there’s some. I think something is happening in the intellectual sphere that is going to trickle down into Hollywood very soon. I’m starting to read a lot of academic books that are starting to question some of the assumptions that have undergone this current age and some of the mistakes that we’ve made. The assumptions of relativism, that all cultures are equally valid. All morality is equally valid. The assumptions of materialism. I think those things are coming under question at the very highest level of thought. One of the things we’re seeing that’s really interesting—and a lot of media is trying not to take notice of this trend—is that religion, which by default was always believed to be a populist thing, is becoming a very elite thing. Religion is spreading among the intellectual class, the upper classes, and is really under fire in the lower/middle class. So the more education people have right now, the more likely they are to be religious, which is a really interesting phenomenon. If what I think is going to happen happens—that we’re going to have an intellectual revival of religion— that’s going to change a lot of stuff. It makes a difference whether we’re ‘meat puppets’ as someone once put it, or whether we’re children of God. You start to think about things differently. Andrew, you’re fond of saying that politics are downstream from culture. Tell me what you mean by that. The British poet Shelley once said that poets were the unacknowledged legislators of the world. What he meant is that the culture shapes our consciousness. It not only reflects our consciousness, but also reflects our consciousness back to ourselves so that our consciousness changes as it comes to know itself. As we change, our culture changes. And as our culture changes, our politics change. Right now, for instance, we’re seeing the fruition of 40-50 years of this steady drumbeat of radicalism that has been injected into our culture, into our academy, and into our news media. That accounts for a lot of disillusioned and decadent art that we’ve seen over these last 40 or 50 years. And this peddling to us that our way of life is no good, all corporations are bad, all religious people are small-minded bigots—things that we’ve seen over and over again. These are radical ideas that entered the culture. And then enter politics. I strongly suspect—and maybe I’m being too optimistic—that the period of radicalism is coming to an end. As new ideas filter down from the people who have ideas, and they filter into the arts by artists who learn from those people with ideas, that spreads out into the entire culture. As the culture changes, the politics change. Remember, when a guy walks into a voting booth, he has an image of what’s important in the world. If his image is a world of God-created individuals, each with his own dignity and his own importance, the votes that he casts are going to be very different than if he sees us as elements of a greater machine called “the State” who have to be of service of the State. Those two votes are different, and they’re created in the culture. For conservatives who want to have more of a voice in the culture, in media, in entertainment, what is the answer? What is the key to effecting cultural change? It’s a really interesting moment because technology is undermining the gatekeepers, and the gatekeepers are almost all of one mind. They almost all come out of this left-wing academy, they’re all trained in things that you must say, certain questions you can’t ask, certain words that can’t be used. They call it political correctness, but it’s really just tyranny. It’s tyranny of the mind. Yet at the same time you have YouTube, where you can get 15,000,000 hits on something where there was no gatekeeper. You have e-publishing where you don’t need an editor to decide what’s going to be in something. You have all these new technologies that are just bypassing that phalanx of cultural guardians, and so what I would say is that it’s time for young people, for all people, for all creative people to be fearless. To fearlessly speak out for those ideas that are unpopular. The ideas of God, the idea of life, the idea of the importance of the individual. Those have always been minority points of view that need to be defended by fearless people, and that has to happen again. And technology might well allow that to happen. *This Article First Published by World New Service.